One of the biggest must-have for parents these days (that our parents didn’t have when we were growing up) is a digital baby monitor with a camera. The camera gives you peace of mind by letting you keep an eye on your baby throughout the night, even when there’s low light. As far as baby monitors go, the Motorola Digital Video Baby Monitor seems to be one of the best! 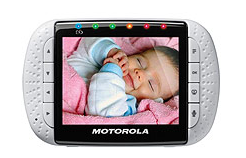 The monitor has a large full-color screen that has pan, tilt and zoom functions to keep an extra watchful eye on your precious little one. There is also a microphone that allows for two-way communication. Other goodies include an out-of-range alert, a room temperature display, a sound level indicator and a low-battery alert. Five lullabies are programmed into the monitor in to soothe your little one to sleep. When you can’t be in the room, this is the next best thing! This baby monitor comes with a camera, a parent unit, a support stand, a user’s guide, a quick-start guide, a rechargeable battery pack and two power adapters. 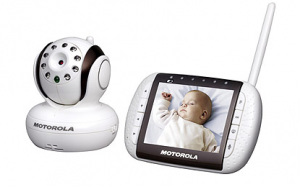 One Southern Savers reader will win a Motorola Digital Video Baby Monitor with 3.5″ Color Screen and Wireless Camera. Tell me in a comment below your favorite feature of this high tech baby monitor.